The United States didn't want Texas a as a state because it was a non-slave state. The independence of Mexico cast doubt on the future of the institution in Texas. From 1821 until 1836 both the national government in Mexico City and the state government of Coahuila and Texas threatened to restrict or destroy black servitude. Neither government adopted any consistent or effective policy to prevent slavery in Texas; nevertheless, their threats worried slaveholders and possibly retarded the immigration of planters from the Old South. In 1836 Texas had an estimated population of 38,470, only 5,000 of people who were slaves. Then the Texas constitution was written in 1836 the slaves were told that they can go back to the owners. When this was givin to the slaves it grew thoughout the republic. American slavery was permently an economic institution-a system of unfree labor used to produce cash crops for profit. The effect of the institution on the state's general economic development is less clear. 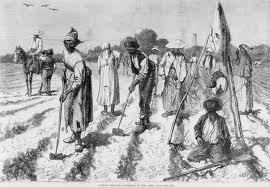 Slavery certainly promoted development of the agricultural economy; it provided the labor for a 600 percent increase in cotton production during the 1850s.Only 1 out of 4 families had slaves.The only people that really had any slaves are the people that are rich. Why Texas wanted to annex was because they wanted protection and a money system. In 1844 James K. Polk became president and wanted to annex.Texas voted and we passed Texas was a slave state. Pros- They had slaves in order to get things done, work to provide for your home, and to grow food. Cons- You have to work in the weather, you have to be gone alot from your families, and you have to work hard to earn the money.